Though Campo Santa Margherita is the famous center of student nightlife in Dorsoduro, and all of Venice, this is also the neighborhood most favored by Venice' well-heeled artsy set. Thus, here you will truly find bars for every taste and budget from the cheapest spritz in Venice to the most ornate and unusual cocktails available. Where it all collides in the small hours of the morning is, of course, at Piccolo Mondo by El Souk the oldest and most famous nightclub in Venice. With a bar for every taste and budget, as well as several osteria, pizzeria, and snack bars, Campo Santa Margherita is one of the main centers of nightlife in Venice. 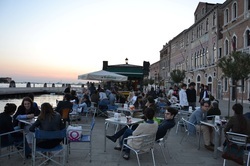 Venetians, students and travelers from all corners of the city congregate in Campo Santa Margherita in the evenings, fill the bars and spill over into the campo at large. Some of the bars to be found here include the Cafe Rosso, a former communist party meeting house and now the home of the cheapest spritz in town, and Madigan's Irish Pub wherein you'll find not only beers on tap but also a very unusual array of cocktails and shots many of which include a splash of absinth. It is not unusual to find a drum circle or some kind of performance art going on in the square. El Chioschetto in Venice, 1406/A Dorsoduro, on the Fondamenta Zattere. A favorite late afternoon and evening spot among students, locals and everyone who enjoys having drinks and snacks outdoors along a canal and watching the sunset. That's just about everyone in Venice! El Chioschetto is a small and laid back bar located towards the western end of the Zattere. They have outdoor seating on the canal, reasonable drinks and good sandwiches. El Chioschetto also occasionally hosts live music. All in all, a fantastic place to relax on summer evenings. Laconda Restaurant Avogaria, 1629 Dorsoduro, Calle Della Avogaria. So much more than just a bar! Avogaria is a stand-out venue in Venice in so many ways. It has an ellegant bar and restaurant and also hosts guests in three private suits each with an outdoor terrace. Avogaria is also one of few openly gay-owned businesses in Venice and far and away one of the most diveristy-friendly places in the city. I have opted to palce Avogaria in the bars section because even if you're not in the market for a fancy meal or an ellegant suite, this place is a must visit even if it's only for one drink! You can learn more about all the offerings at Avogaria on their website. Piccolo Mondo by El Souk, 1056/A Dorsoduro, On Calle Corfu, Near the Accademia Bridge. The Piccolo Mondo (Small World) by El Souk is the original disco of Venice and it's still spinning every night. They've got a fantastic disco-esque dance floor, some fun D.J.s and a 100% night fever vibe. 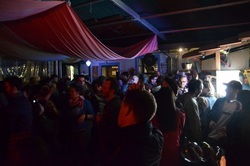 The Piccolo Mondo is open from 11 PM until 4 AM. There is a small cover charge, and the spiked doorway certainly lends the place an air of exclusivity. But, you will most likely find Piccolo Mondo hosting a combination of younger tourists and Venetian night-owls. Keep you eye's peeled for their small sign. There's a party going on inside, but you'll never know it from the street. Al Giardinetto, 2910 Dorsoduro on Rio della Frescada Near Campo San Toma. Though Giardinetto is known on Tripadvisor for it's lovely canal-side location and meals, under it's new ownership it has also taken on a new late-night life as a club. When the Bacari are closing, Giardinetto is just getting going with D.J.s, beers and wines on tap, and a rolling crowd of just about everyone in Venice. Standing and dancing room only on summer nights.